4 Bedroom Detached House For Sale in Wiltshire for Guide Price £1,000,000. WATERSIDE - Stepping Stone Mill is a charming and unique Grade II Listed period country home situated in a stunning position just north of Bath. The original mill, the mill cottage and outbuildings have been sympathetically restored, incorporated and extended whilst retaining much of the character and enhancing many period features. The accommodation is arranged over a number of split-levels creating a superb home for entertaining and taking full advantage of this magnificent rural setting. Providing a variety of configurations in layout a vaulted drawing room leads out onto the terrace which is also approached from an oak framed garden room. A central lobby not only leads to the master bedroom suite but has stairs ascending to the fourth bedroom and comprehensive storage off a further attic room. This is a truly unique home that can only be truly appreciated by inspection in order to understand the quality of workmanship and thought in its design. 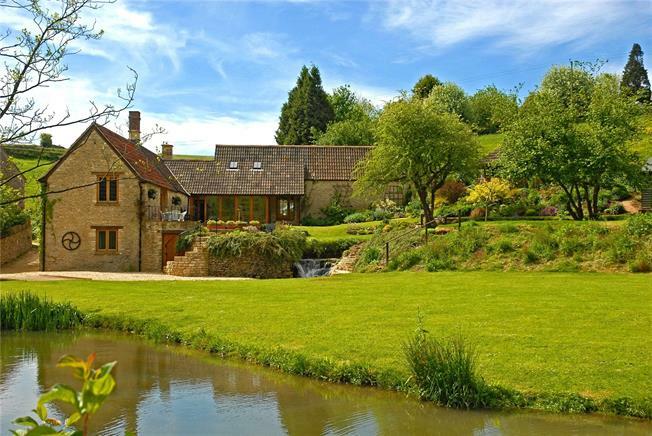 Stepping Stone Mill occupies a quite stunning location in gently undulating countryside in the valley of the Broadmead Brook in North Wraxall, just north of the village of Marshfield and bordering the Badminton Estate. This picturesque situation is nestled amidst a number of further villages close by, offering a variety of local amenities and is within an area of outstanding natural beauty. Whilst the tranquillity of its setting is a major feature, access to the major routes is excellent with the M4 only 3 miles distant in the north and the city of Bath some 10 miles to the south, with a main line railway station to Bristol and London Paddington. The setting and grounds of the mill are a wonderful feature and provide a stunning back-drop for entertaining in all seasons. The gardens extend to just under one acre, including a paved terrace, the millrace bordered by attractive landscaped surrounds of shrubs and trees, a kitchen garden and a level lawn look across the millpond to a stunning view and the unspoilt countryside beyond. To the front is ample parking on an extensive drive leading directly to the front door. Services: Mains electricity and water. Private drainage and oil fired heating. Council Tax Band F.